Designed by Guide Don Rotsma of Portola, CA. Don guides mostly on Lake Davis near Portola. Lake Davis is reknowned for it's damsel hatches and guides are reknowned for tying durable, simple patterns that they can provide their clients which catch fish. 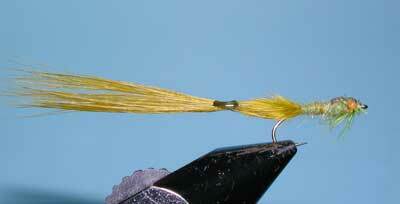 Don extends the marabou tail to 2x's the hook length and knots the tail with thread for a simple extended body. The thorax is dubbed around the shank with a scud back wingcase. Don also utilizes Ice Dubbing Blend into the thorax dubbing and attaches Red-Mono eyes devised from Amnesia running line for an attraction effect. Colors of the damsel nymph can vary. 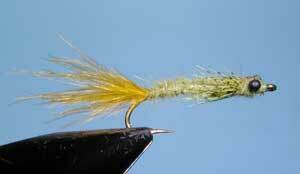 Generally, dark colors are in the early stages of the hatch and they will progress to a tan or golden brown. Don uses a color transition of Dark Olive, Brown, Black, Medium Olive, Golden Olive, Tan, Golden Brown.